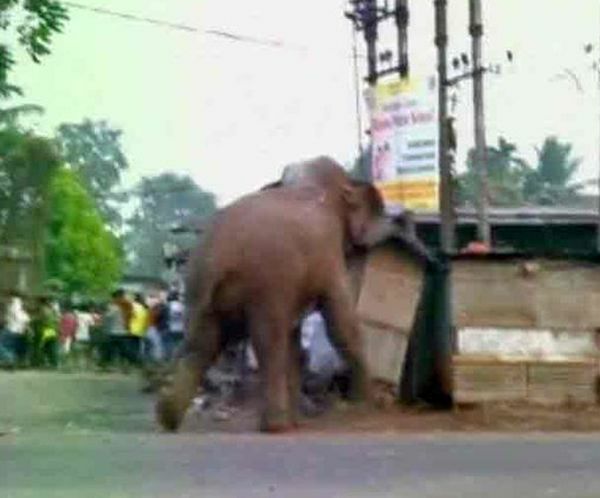 A rampaging elephant on Wednesday strayed from Baikunthapur forest area and entered West Bengal's Siliguri town damaging buildings, police said. An elephant which had strayed from nearby Baikunthapur forest to Siliguri town went on a rampage for around seven hours damaging over 40 houses and some vehicles before it was tranquilised. 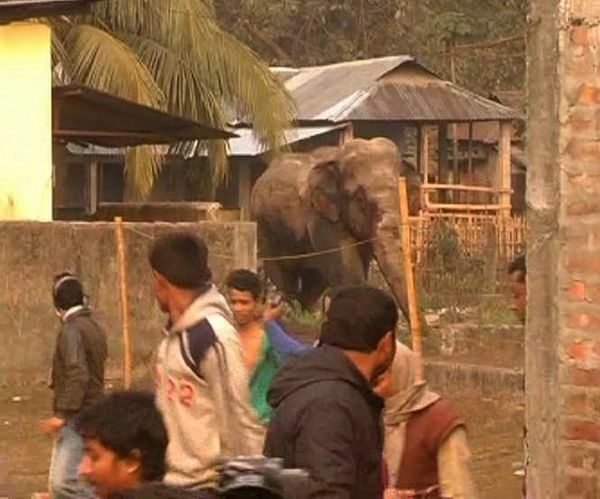 The elephant was first spotted at Dabgram and Fulbari area of the North Bengal town in the early hours. 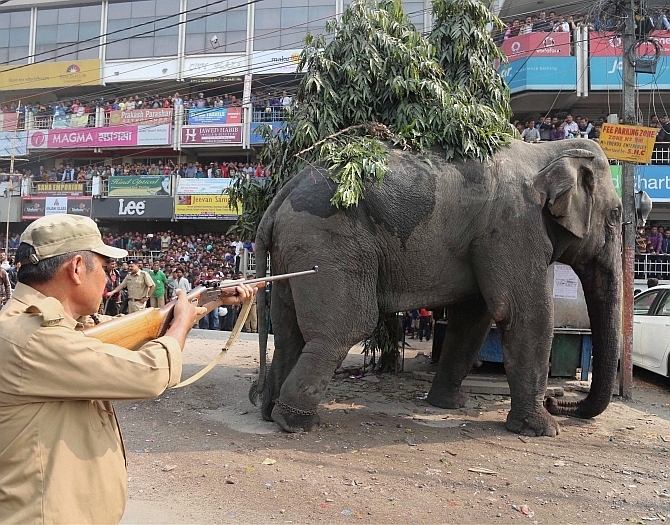 Seeing the elephant, panic-stricken people started running helter skelter and Forest personnel rushed to the spot to drive away the pachyderm to the forest. The Forest personnel fired tranquiliser dart at the jumbo, but it failed to have any effect on the elephant and instead it went berserk and turned its wrath on the houses damaging walls and pillars. Police had to use water cannon to keep away curious onlookers as the elephant went from Ektiasal area to Haidar Para, Sibram Palli, Temple Road and some other pockets of the city and even flattened some vehicles at a car garage after razing the boundary wall, a senior district officer said. The all-important Sevoke Road had to be closed for traffic as the mob took over the street on trail of the jumbo, the officer said adding an unspecified number of people suffered bruises in the melee but were discharged after first aid. At least 40 houses apart from the garage were damaged by the pachyderm as it got annoyed due to the commotion and after being hit by the tranquiliser for the first time, a top forest official of Baikunthapur division said. 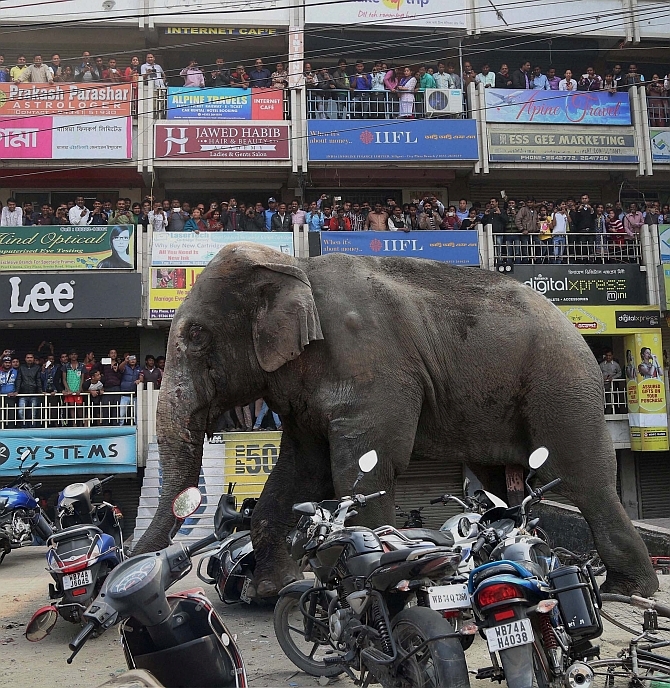 The elephant was finally tamed after seven hours when it was hit by tranquiliser dart for the second time as it headed towards a shopping mall ground floor. As it got drowsy the jumbo was put on a large 12-wheel truck with the help of two cranes after being tied with ropes and taken to Sukhna forest for release. The forest official said it will be examined by vets before being released. 21 award-winning wildlife photographs of the year!